Fist Salud brings us an inside look at 44Clash, one of the most talent-stacked and legendary yoyo contests of all time. Featuring Zach Gormley, Ahmad Kharisma, John Ando, Yuuki Spencer, Palli Gudmundsson, Christopher Chia, and more. Four-time Singaporean National YoYo Champion Christopher Chia is headed to the World YoYo Contest, and our friends at Acquaintance have given us a sneak peek at what Chris will be bringing to the stage this year! Chris has always been an incredible yoyo player, but his trick construction in this video is next level. Good luck in Tokyo! Yoyo used is the Something Anglam CC. YoYoRecreation is showing their friends at sOMEThING some love in this new video, featuring Iori Yamaki and Christopher Chia. Three minutes of top-level play, beautifully filmed and edited. Seriously, this is one of the best videos of the year. Amazing. Yoyos used are the Draupnir by YoYoRecreation and the Anglam ver.CC by sOMEThING. Here’s a new promo video for Christopher Chia…it’s made of older footage, but we can watch Christopher throw all. day. long. so we’re good with that. Thanks to Jayson Lim for the video! Yoyo used is the Anglam ver. CC by sOMEThING. Three-time Singapore National Champion Christopher Chia’s latest promo video for sOMEThING is absolutely solid. Chia is one of the top 1A players in the world, and it’s great to see him work. Asia-Pacific champion and top World YoYo Contest contender Chistopher Chia takes his turn answering questions for the Trinity YoYo Club. There’s also a beautiful combo at the end with what looks to be the new plastic yoyo from sOMEThING. Chris’ style is just so clean and solid while still looking laid back…that guy is just amazing. I don’t know anything about this event, but I know that you can’t beat demos by Hiroyuki Suzuki and Christopher Chia. YoYoAcquaintance dropped another Christopher Chia video! Christopher is definitely a lead contender for the 2013 World YoYo Contest, as well as the upcoming 2013 Asia Pacific Challenge. YoYoAcquaintance just dropped a new video of Christopher Chia! Hard to go wrong with two+ minutes of new yoyoing from someone as talented as Christopher. Yoyo used is the Superfly Remix by sOMEThiNG. YoYoNews favorite Michael Ferdico straps on the neon sunglasses and gets his sOMEThiNG on with the Anglam ver. CC in this new video. Not sure if it’s *supposed* to be funny (which it is), but clearly Hiroyuki Suzuki and Christopher Chia are getting some love here. Both Hiroyuki Suzuki and Christopher Chia judge the 2min freestyle contest and also did some performances. Winners of the freestyle challenge walks away with great prizes sponsored by sOMEThING. Jayson from YoYoAcquaintance edited this video featuring two great tastes that taste great together: Hiroyuki Suzuki x Christoper Chia! 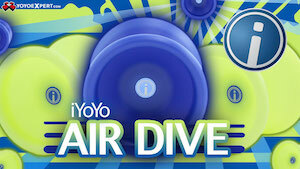 Our excellent sponsors, YoYoExpert.com, have had some great new releases and restocks…take a look! The ANGLAM CC is the new signature edition produced together under Hiroyuki Suzuki’s brand sOMEThING and their new team member the amazing Christopher Chia. Christopher took the ANGLAM to a new level by modifying the overall shape and changing the weight distribution to increase playability. The ANGLAM CC is a mid sized 6061 aluminum yo-yo that fits wonderfully in the hand and just feels like a perfect. Christopher took the ANGLAM to a new level by modifying the overall shape and changing the weight distribution to increase playability. 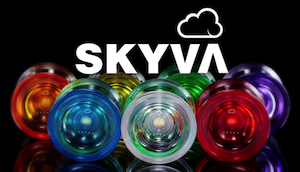 With an all new weight ring system made from a secret heavy metal that not only makes the yoyo cheaper in price but doesn’t lose any play in the process. ANGLAM CC is equipped with a large CBC Center Trac Bearing and 19mm slim pads for tight binds. Features ANGLAM logo engraved on both sides as well as Christopher Chia’s signature right below it. Frizzy hair, members only jackets, shoulder pads and of course leg warmers, all the awesome fashions of the 80’s are back and printed in living color on the new Madhouse RAD. This Extremely loud looking yoyo comes in perfect examples of the 80’s era, with radical cheetah print and heavy metal plaid. This is the look that hair bands would die to have on their set and it plays better than one of their finely tuned guitars. With a smoothed outer soda blasted surface for those rocking grinds and a polished center giving it a glamorous look, this yo-yo bring the 80’s back to life. For just 19.99 the Duncan Flipside is worth getting excited for. Go responsive to unresponsive with just a flip! Includes a KONKAVE Bearing and patent pending flippable spacers to switch to a small bearing at ease! 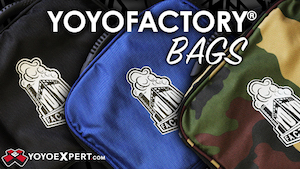 Huge thanks to our sponsor YoYoExpert.com, your one-stop shop for yoyos, parts, and accessories.